The Kala DUB-B Baritone Deluxe Heavy Padded Ukulele Bag for your baritone Ukulele. Soprano size Ukulele in many vibrant colors. Featuring Rosewood Dolphin Bridge and Rosewood fingerboard. A fun and exciting Ukulele for all ages. These Makala Shark Ukulele's come in the popular soprano scale and features an agathis wood top, 12 brass frets, a rosewood fingerboard, custom "Shark" bridge, geared tuners and a Makala nylon carry bag. With a price like this how could you refuse? 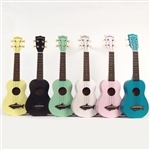 Pick up your Makala Shark uke and join in the growing ukulele fanfare! The Kala KA-15S Mahogany Soprano Ukulele offers a fresh approach to ukuleles. The KA-15S has a Mahogany top, back and sides. This Soprano pumps out a lot of sound despite its diminutive size, and the all-mahogany construction delivers a tone that is bright, yet warm with enough volume that you will be heard while playing with a group. A satin finish gives the KA-15S an antique, well-played in feel. Guitar players will appreciate the low action and the ease of playability. A set of die-cast tuning machines complete this attractive package. The Kala Makala Concert Ukulele is a concert sized ukulele. Kala Ukuleles are simply the best entry level ukes on the market. Both sound and playability usually suffer at these affordable prices but not with the Makala from Kala. This Kala MK-B Makala Baritone Uke is an affordable and well-made uke, a bit larger (30" overall length) than the traditional soprano. This bari uke is tuned D,G,B,E so anyone who can already play a guitar can jump right in, and those looking to play guitar down the road can get a great head start. The Yamaha GL1 Mini 6-String Nylon Guitarlele is half guitar, half ukulele, and 100% fun. A unique mini 6-string nylon guitar that is sized like a baritone ukulele (17" scale) and plays like a standard tuned guitar. The guitarleles tuning is pitched up to A (or up a 4th) at A/D/G/C/E/A.